Sharon Christa McAuliffe, the first teacher to fly in space.�� Selected from among more than 11,000 applicants from the education profession for entrance into the astronaut ranks, McAuliffe had been born on September 2, 1948, the oldest child of Edward and Grace Corrigan.�� Her father was at that time completing his sophomore year at Boston College, but not long thereafter he took a job as an assistant comptroller in a Boston department store and the family moved to the Boston suburb of Framingham.�� As a youth she registered excitement over the Apollo moon landing program, and wrote years later on her astronaut application form that "I watched the Space Age being born and I would like to participate." McAuliffe attended Framingham State College in her hometown, graduating in 1970.��A few weeks later she married her longstanding boyfriend, Steven McAuliffe, and they moved to the Washington, DC, metropolitan area so Steven could attend Georgetown Law School.��She took a job teaching in the secondary schools, specializing in American history and social studies.��They stayed in the Washington area for the next eight years, she teaching and completing an M.A. from Bowie State University, in Maryland.��They moved to Concord, New Hampshire, in 1978 when Steven accepted a job as an assistant to the state attorney general.��Christa took a teaching post at Concord High School in 1982, and in 1984 learned about NASA's efforts to locate an educator to fly on the Shuttle.��The intent was to find a gifted teacher who could communicate with students from space. 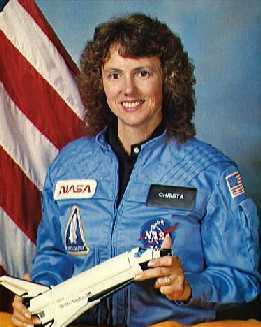 NASA selected McAuliffe for this position in the summer of 1984 and in the fall she took a year-long leave of absence from teaching, during which time NASA would pay her salary, and trained for an early 1986 Shuttle mission.�� She had an immediate rapport with the media, and the teacher in space program received tremendous popular attention as a result.��It is in part because of the excitement over McAuliffe's presence on the Challenger that the accident had such a significant impact on the nation. Artist Russell O'Brien lived in Framingham from 1960 to 1971, and he still misses it. He is a professional artist, and created the painting above in 1986, and to this day copies of it are now displayed in over 60 schools in the U.S., Mexico, and the Kennedy Space Center. The young girl in the painting is his daughter. Mrs. Grace Corrigan, mother of Christa, was presented with 4 of the copies of the painting back in 1989. (Image provided & used with permission of artist Russell O'Brien). Christa McAuliffe/Challenger Space Center, Framingham State College, Framingham, Mass.